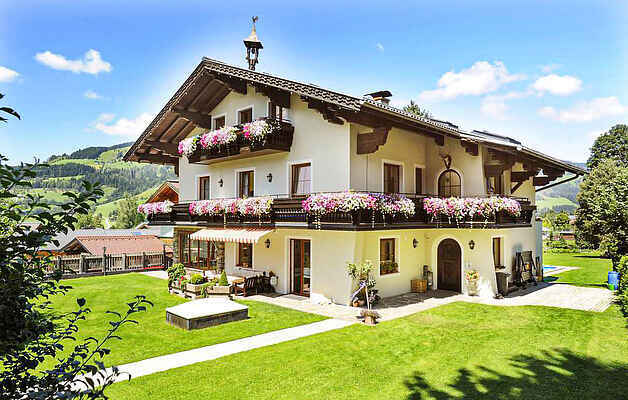 These five holiday apartments are rented in this cosy holiday home in Wagrain. The apartments are newly renovated and beautifully furnished. The town centre with various shops can be reached in about 10 minutes from this place. The tennis courts and the Amadé Water World are only a few steps away. You can unwind and relax in the 4000 square metre garden with heated outdoor pool. For a small fee you can also use the solarium. The Wagrain bakers also supply fresh bread and pastries daily on request. The cosy lounge is at your disposal. In summer you can find numerous hiking trails, bathing facilities and attractions in Wagrain for the young as well as the grownups. Here, you can get acquainted with nature and culture of the people of the Salzburg Mountains. Lush alpine meadows, dark forests and captivating mountain villages are waiting to be discovered. Some of the highlights of Wagrain are: Water World Amade, Wagraini`s Grafenberg, Wagrain Mountain bike Park, and much more.... You are entitled to a daily free entrance to the Water World Amadé!